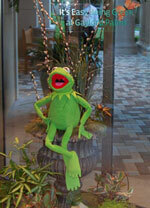 It’s easy being green at Gaylord Palms is the sign that greets guests arriving for the National Biodiesel Conference in Orlando and even Kermit the Frog would agree. NBB has retained the services of The Spitfire Agency to ensure that the conference generates as little waste as possible. Greening efforts include waste reclamation, digital marketing as opposed to print or direct mail, tree-free printing, energy offsetting, and donating leftover food to local food banks. 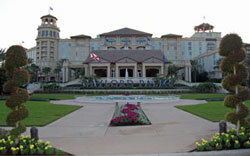 The Gaylord Palms and guests are cooperating in the effort by avoiding water waste by only washing towels and be linens when needed, not replacing soaps or shampoos unless empty, keeping room lights off and curtains drawn when rooms are empty to conserve energy and having recycling containers throughout the hotel. The hotel is a gloriously green venue for the conference, featuring a spacious atrium filled with palms, waterfalls and even wildlife including gators and turtles. Be sure to check out the Flicker Photo Album of images from the 2008 National Biodiesel Conference by clicking here.